Educating the Client on RDR - Whose Responsibility Is It Anyway? The FSA assures the IFA community that RDR is in the customers benefit. However, seemingly no one has canvassed IFAs on how their clients feel about the impending changes in regulation. Therefore, PanaceaIFA recently ran a survey asking IFAs if they believe their clients see the RDR proposals as a benefit as well as measuring how much they really know and understand. With over 740 responses it is clear that consumer awareness is very low. The following presentation aims to explore some of the consumer responses raised as well as illuminating client attitudes and how they can be tackled. - appropriate qualifications for financial advisers. 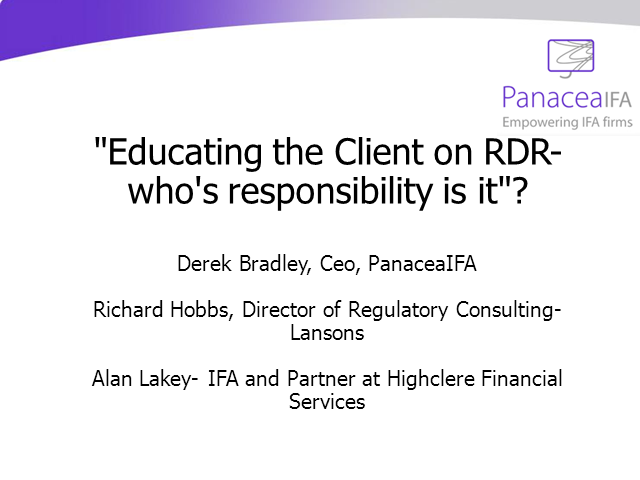 Title: Educating the Client on RDR - Whose Responsibility Is It Anyway?